Happy Spring crafty peeps! I hope you are having glorious weather today! WOW! 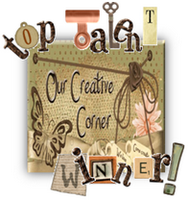 I have been honored by the gals at Our Creative Corner to be spotlighted as a winner for today's Top Talent Thursday because I've won a few of their challenges (See my side bar if you want to know which ones.). They've asked me to make a little something that they will showcase on their blog today, as well as take part in a brief question and answer session...that was the scary part. 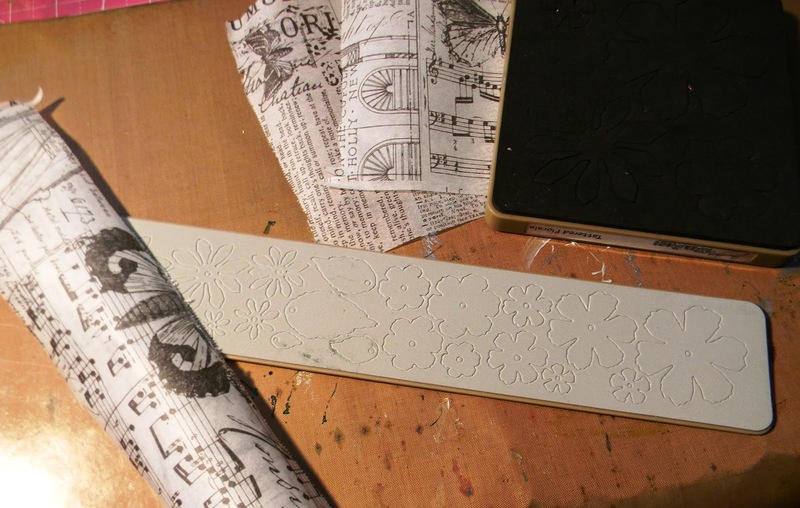 You will need to visit their blog to see what they wanted to know, but here is my project and a step out for it. I thought something Spring-y was appropriate, and I've included some "Tattered Florals", so I am submitting this to Tim's challenge as well. 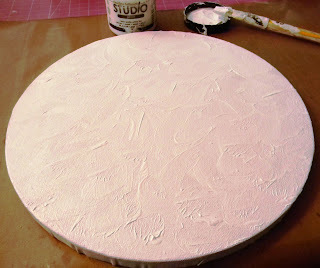 I added Claudine Hellmuth Gesso esso to the round canvas first, adding texture, but I wish I wouldn't have, because I had problems later on with my Dylusions color really staying and popping like it should. Live and learn. 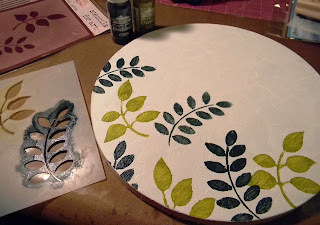 Using Wendy's Leaves and some Ranger Acrylic Paint Dabbers in Stream and Citrus, I stenciled away. More stenciling again, but this time with Wendy's Embossing Paste and Flowers. I love this stuff! 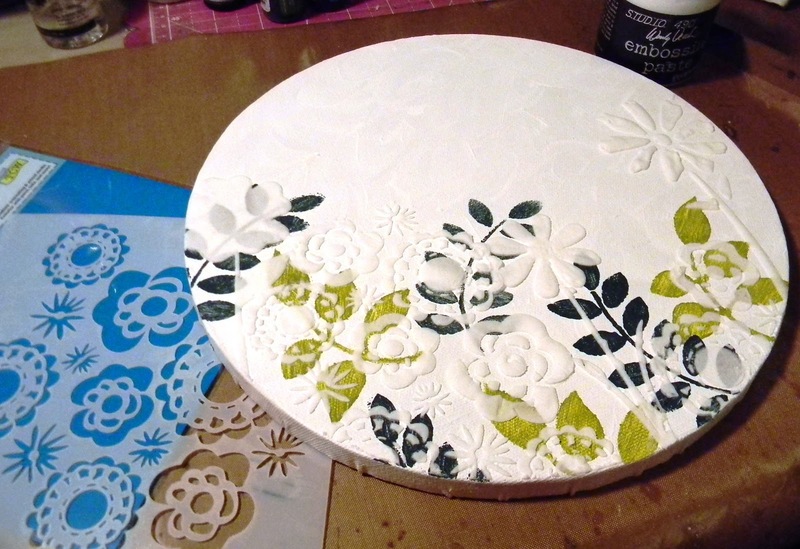 More Embossing Paste and more Florals, but this time with Claudine Hellmuth's flowers. 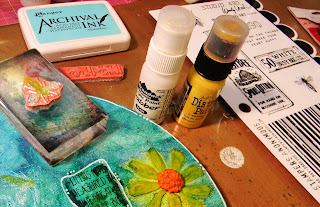 Spring is a little windy, so I stenciled in some gusts with The Crafter's Workshop Mini Capricious and Pearl Paint Dabber. I love using Tim's new Distress Paints over Wendy's Paste. With a paint brush it's very easy, and because of the sponginess of the Paste excepting the paint so well you just don't have to be so precise, and I like that. PLUS, it's my new favorite technique...it's acts as a resist to Dyan's Dylusions Ink Sprays! Love that! Now comes the mess and the fun...Dylusions. But, like I said above, I should not have given this gesso and my color would have adhered better. I had to spray many times. You can see the resist though. 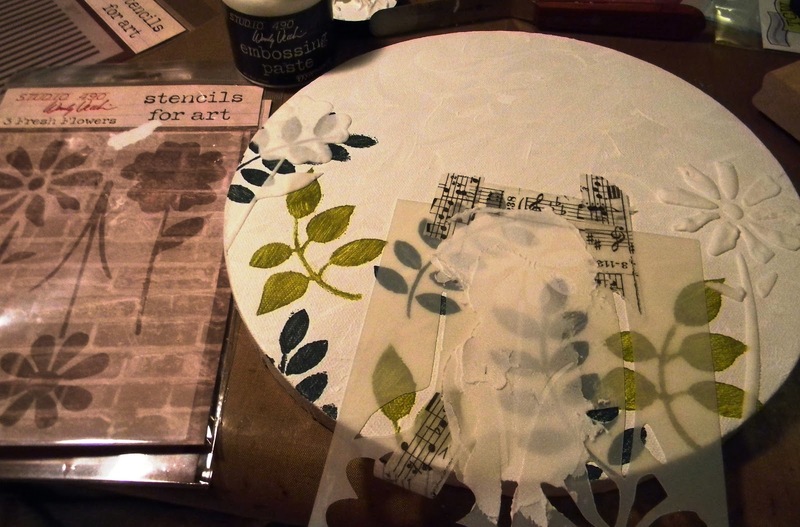 I added some Wendy stamps with Archival to a few places among the grasses. 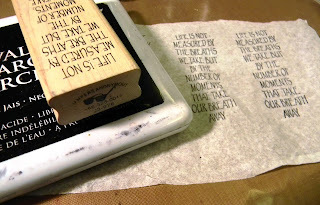 I stamped one of my favorite quotes onto tissue paper from Stamper's Anonymous. I adhered it the canvas with Glue N Seal, and it sort of made an inky mess, but I think I like it. 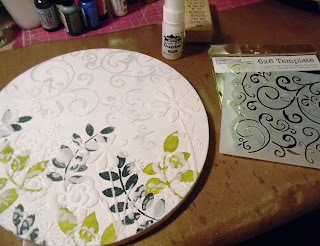 Tim's Tattered Florals Die from Sizzix was my very first die. I've used it more than any other, and it has made countless gifts...countless! So I love that he used it for this challenge. I also love that he came out with a Tattered Flower Garland Sizzlet Die last year that coordinates with this. 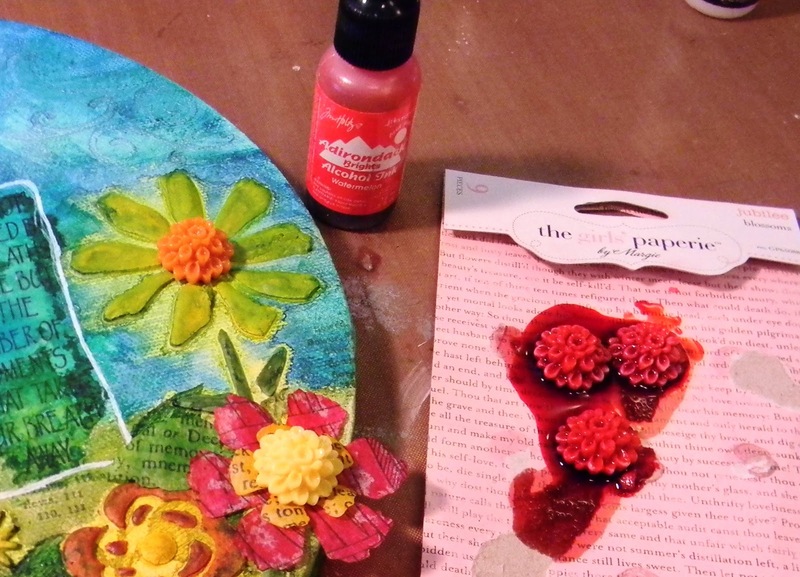 All the Tattered Florals are on here but in mini size and with holes in the centers and leaves as well. I decided to use this too. I die cut several of each die using Tim's Melange Tissue Wrap. 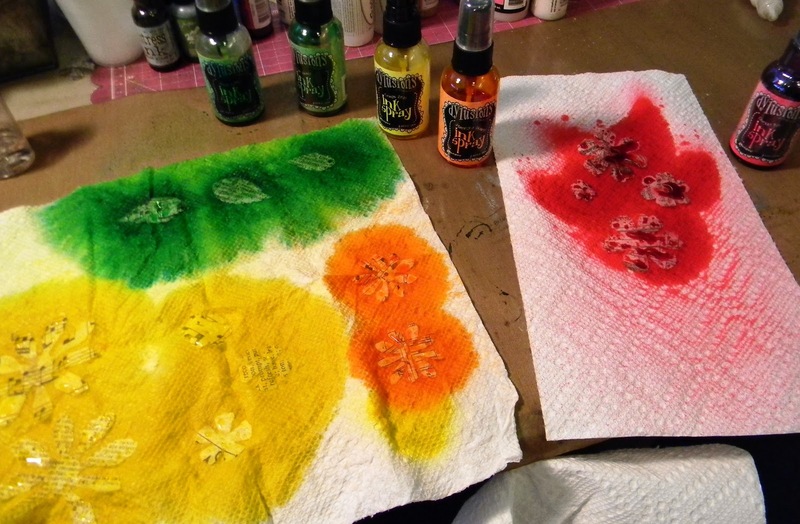 I had just cleaned up my table, so in an effort to keep it that way I misted my inks onto the Tattered Florals on the paper towels. Yes, I can be lazy! I did save the towels though. I stacked these up and made a bouquet and added them to my canvas. Now I have a great 3D look. Finding some goodies from my stash from The Girls Paperie, I used Watermelon Alcohol Ink to color them up and give them some detail a bit and used them as centers on a few of the flowers. I did some doodling on the canvas with a white pen as well. 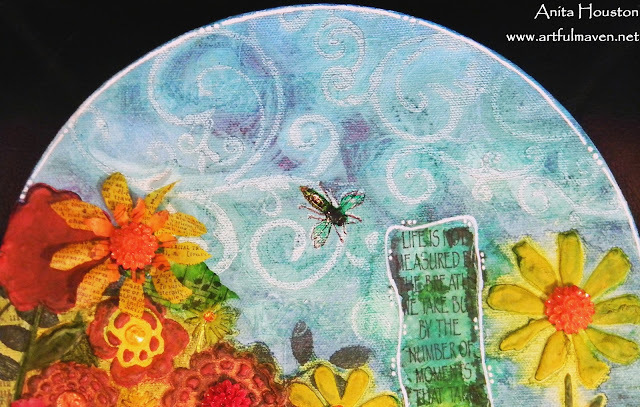 I thought this needed a little something else, so I stamped a bee using Mustard Seed Distress Paint and Pearl Paint Dabber. I dried that and stamped it again in Jet Black Archival. I added Crackle Accents over the top. 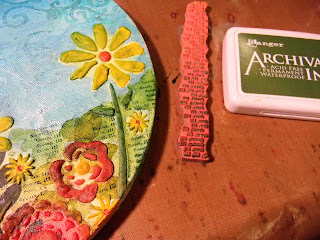 While that dried I stamped the Numbers from the same set in Snow Cap Pigment and then Aquamarine Archival on top of that. While you can see it fine in person, I just couldn't get it to show in the photographs. I thought I'd see what it looked like outside while enjoying a gorgeous Spring like day. It was perfect outside. I needed a swim suit,. ice cold drink, and lounge chair! 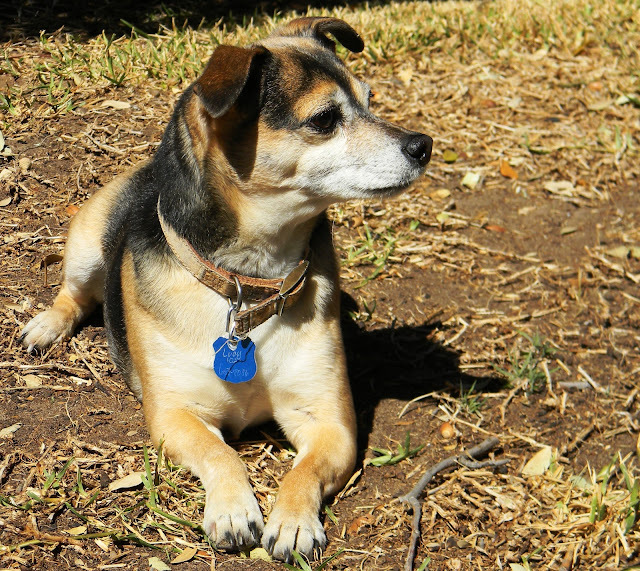 This is Lucy, who enjoyed the sun with me as I photographed away. She is the 4th child for sure! Love this! The colors are so bright and cheery and springy. I love how you used the embossing paste to make some of the flowers pop forward for dimension. I'm jealous you have such nice weather-we're in the snow!!!!! Ugh! I need about 100 of these hung around me house to let me think it is really spring and not winter. I am well up for doing one of these as soon as my bottles are done . Wow, so many techniques and you share them all - I do love to read your posts, it's a bit like having a lesson! I'm so glad someone else thinks Spring should be bright colours - I'm with you on that one! I love the depth to your piece, the colour, the techniques and I also think it's so good to have something that isn't square or rectangular for a change. Oh my goodness, this is such a breath of spring. It snowed here again yesterday so this looks incredibly uplifting. The texture is amazing and the colours are so vibrant and rich. If you spread Golden's Absorbent Ground over your gesso, the Dylusions inks absorb very well again and you still get the yummy gesso texture. That little bee makes me smile. He must be delighted with the choice of beautiful flowers. Your 4th child is a cutie, too! Congrats on being top talent on Creative Corner! I can't think of someone more deserving. I love the canvas, so many wonderful layers and cool techniques. Beautiful!!! THIS takes my breath away! It's absolutely gorgeous! I love how bright and cheerful it is. Thanks so much for the step-by-step. I'm going to get me some "Wendy paste" and give it a go!!! This is SO spring! And thanks for all the details and tips. It was like taking a class and I learned a lot! Congratulations and WOW! This is gorgeous. I'm glad you included some step-by-steps, because, well, I'm a copy-cat. Love your work, always. Congrats on the top talent award. Love this canvas! Everything about it from the shape to the colors, and all the layers and layers of flowers. Great piece. OMG this is flat out fabulous....the colors are so bright and vibrant and once again your layers are kind of mind exploding actually!! I'm really going to have to try some of Wendy's paste....geez!! Your work is always so full of life and fun; it's just wonderful. I have made that same mistake, more than once I'm afraid, of using Dylusions over gesso. One of these days I'll learn - hope your faster at that than I am! Happy Spring. Wowzers... amazing colours and textures and, as always, an outstanding step-by-step tutorial... can't wait to check out your Q&A... congratulations on your Top Talent (well, we know it's that!)... high time!! 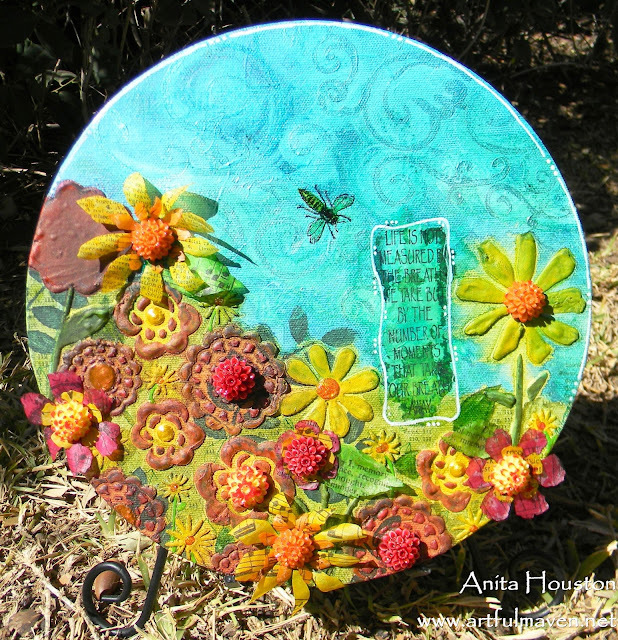 You never cease to amaze me Anita with the tremendous life force that springs from your creations. A whole lotta inking and more has gone into this canvas and it is totally FAB-U-LOUS! Wow - that's worked incredibly detailed - I look at it for so long and would prefer to emphasize it once to feel the contours. Fantastically beautiful - great work! Anita! Thank you for the sweetest comment! 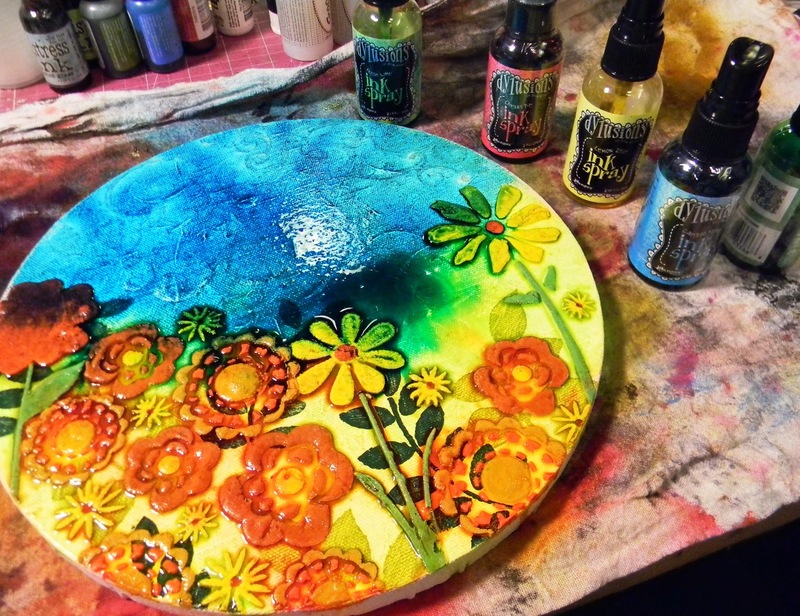 Your project is so beautiful and makes me want to get all of Tim's new distress paints!! This is fabulous and very inspiring!! Congrats on your well-deserved win!! This is such a beautiful canvas, Anita! You did a fabulous job on all the flowers! Truly a work of art! 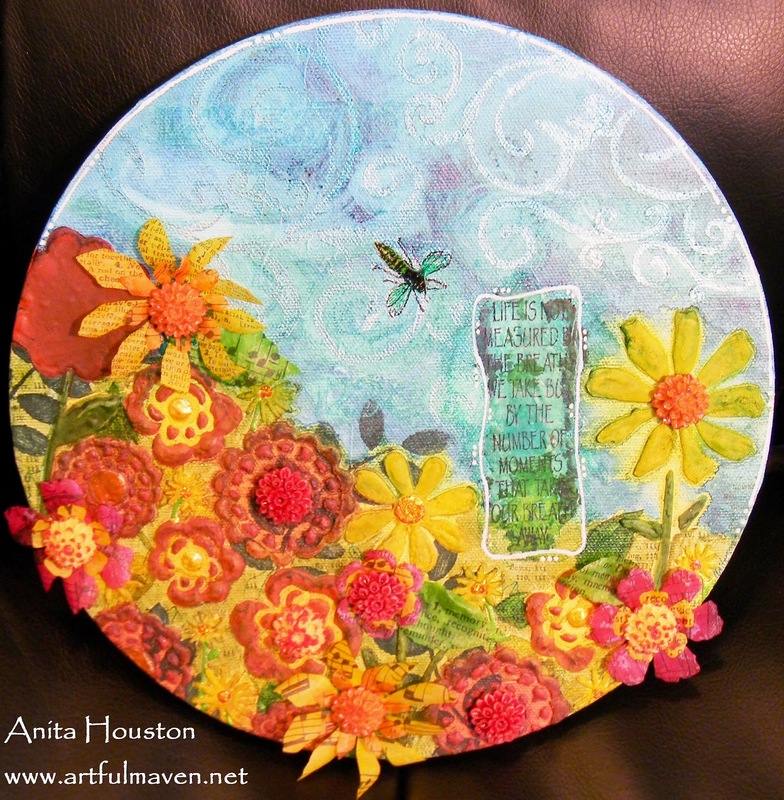 What a fun piece, Anita, and very appropriate of Tim's challenge. Your color palette definitely screams Spring. Congratulations on your feature at Top Talent Thursday! 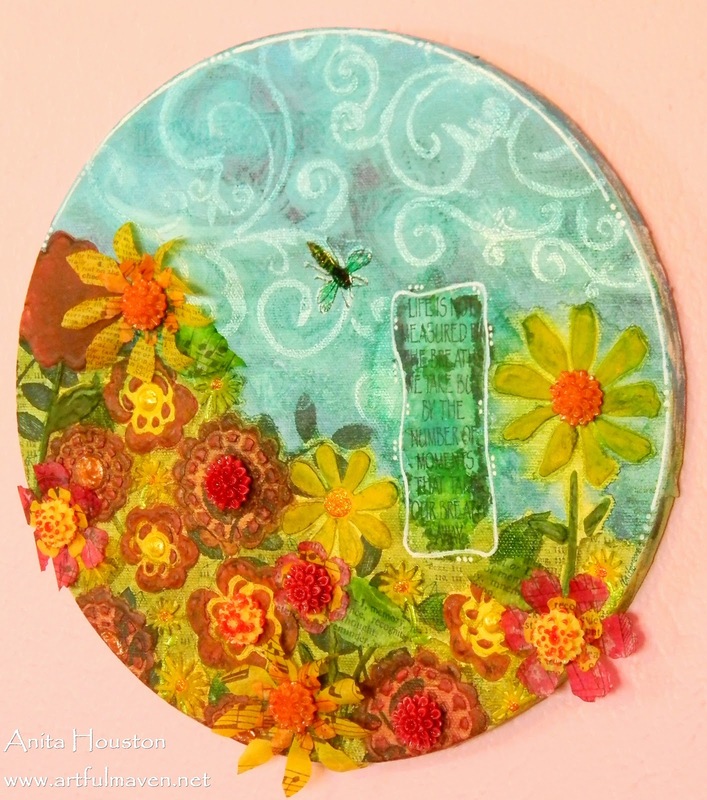 Your canvas says spring, spring, SPRING!! I love it! Wow, love it Anita! I have never tried the paste, so now I have to! Thanks for sharing the how to! I love your florals, and sky and that one bee! Lucy is lucky to have a nice day to sit outside, here in NYC it is still freezing. Thanks for sharing your spring!! Congrats on your win, they know talent when they see it! I have read and re-read this post, and studied your pictures, several times, and can't get over how amazing it all is. When I saw the first picture, I thought it was embroidery. Wow Anita, you have truly outdone yourself. This is just beautiful. Your lovely spring piece has brightened my day. We have snow again and I am longing for a bit of warm sun. 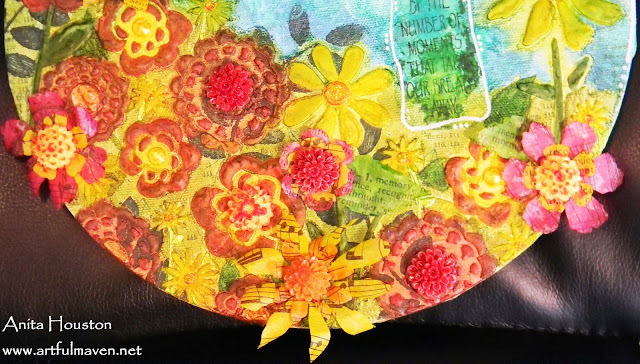 Love the round canvas and all that texture. Congratulations on your award - well deserved. Amazing texture, Anita! I can see why you were featured over at Our Creative Corner! It is So bright that it reminds me of spring. And I love all the fabulous flowers! What a gorgeous wall hanging! Fabulous quote and a beautiful garden. Love the different ways you did the flowers - it's just like a wildflower garden with so many unique and individual flowers. Love the stenciling, too. A beauty! And I thoroughly enjoyed the interview, as well. Happy Weekend. Congratulations!! This is just stunning! Te colors are gorgeous, and we all want spring. Love your round canvas todo this on too. Step by step is very helpful to inspire me to try out some of your ideas. And, love the pup photo!! Wow GF, amazing is right! Looks like it's a tapestry, all hand sewn by you of course! Lovely, just lovely. This is really very pretty -- marvelous colors and gorgeous flowers. You have inspired me a bunch!! Gorgeous! Love all the texture!!! Simply beautiful! Love how you layered and added so much texture. Congrats on your award, hehehe...totally love! 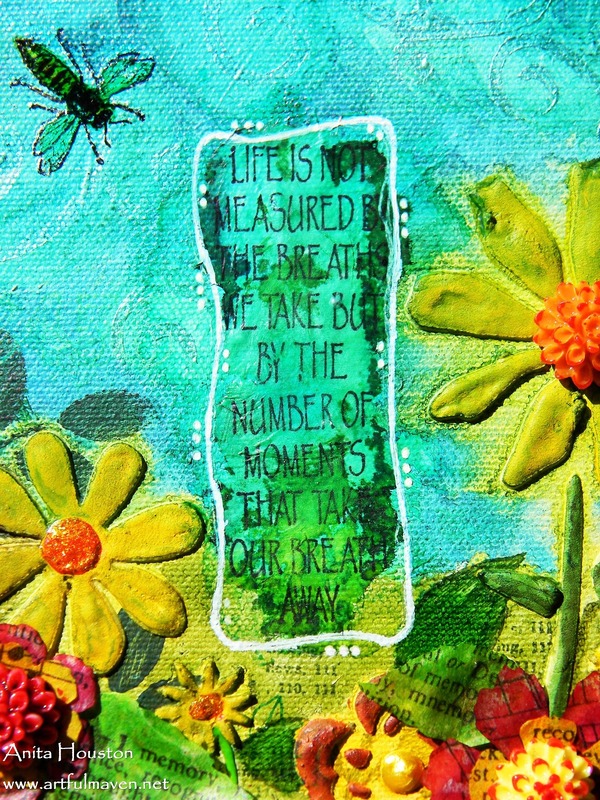 Love your canvas and all the texture you built onto it! 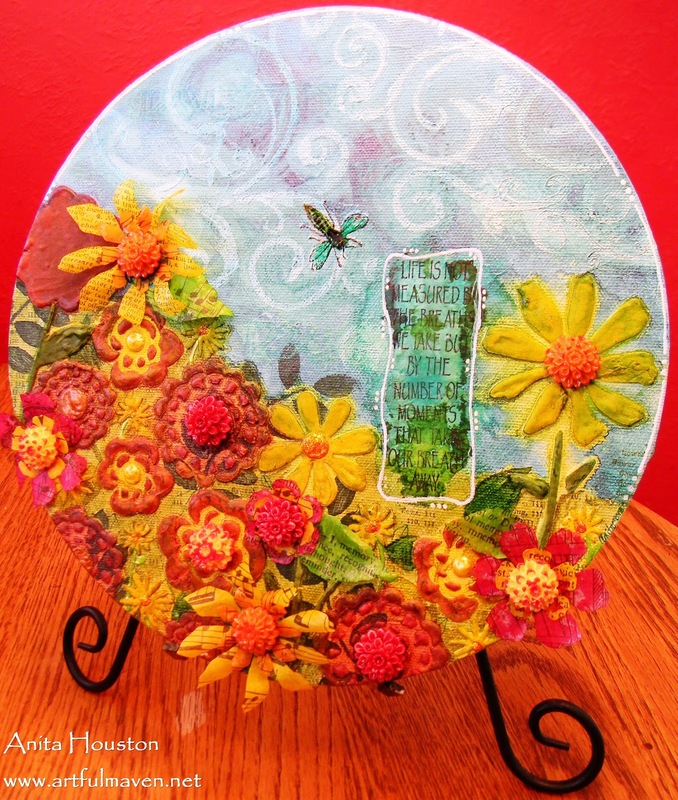 Great way of using the Tattered Floral die! 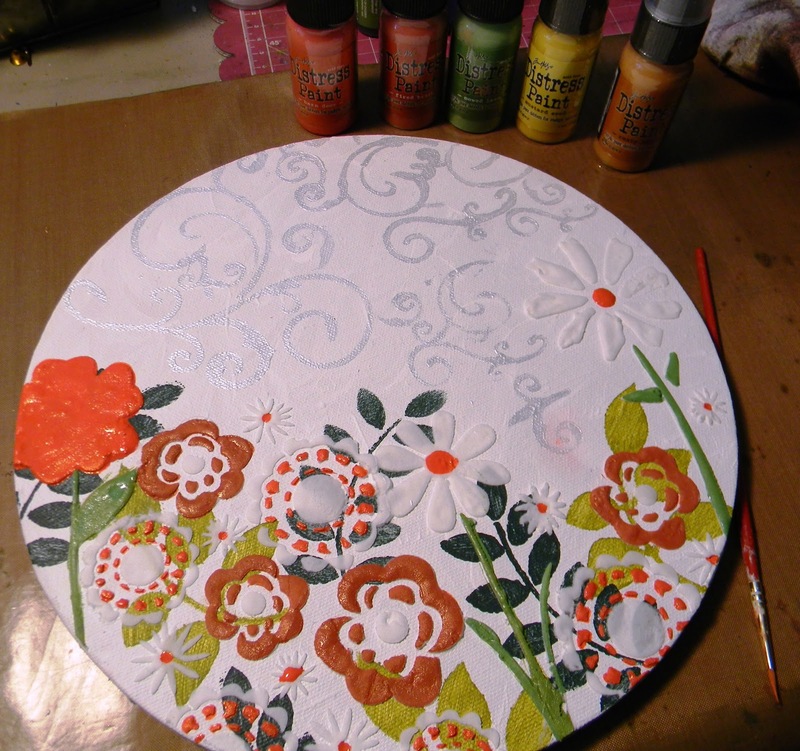 You have sparked my creativity...and a desire to work on a circular canvas! Now thats what I'm talking about, Spring flowers full of color!!! Just what the Dr. ordered! Fabulous Anita!! !